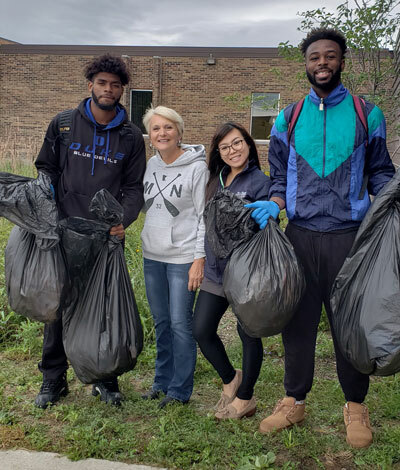 A campus clean-up was scheduled as part of Student Success Week, and eight students and three staff headed out early afternoon on Sept. 27, armed with garbage bags and good attitudes. The group cleaned up areas around the Main, Heartland, President’s, and Health Sciences buildings. After they finished, they had eight large garbage bags of trash that was no longer cluttering up campus. The weirdest things the group found while cleaning up? A diaper, socks, and other clothing. One student was disappointed that he found no money. Watch for another campus clean-up to be scheduled in April around Earth Day (weather permitting). Organizers would like to make this happen every semester, and it’s a fantastic way to meet fellow students and make a difference.